As we have since July 2006, each Friday we’ll post our sampling of cigar news and other items of interest from the week. Below is our latest, which is the 534th in the series. 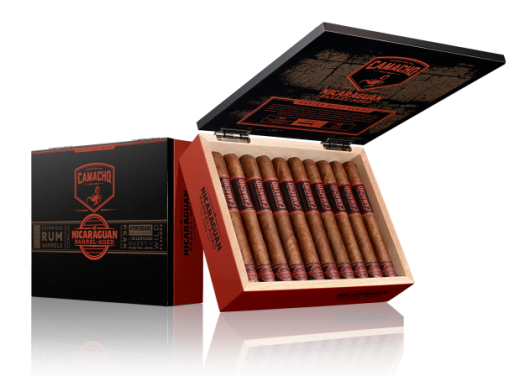 1) On Tuesday, Camacho announced Nicaragua Barrel-Aged, a new four-vitola line that will launch in the U.S. on June 22. The blend includes and Ecuadorian wrapper, Mexican binder, and filler tobaccos from Nicaragua, Honduras, and the Dominican Republic. “We began working with intense Nicaraguan-grown Corojo fillers, painstakingly aging them in extra-old Nicaraguan rum barrels for five months,” explains Dylan Austin, vice president of marketing at Davidoff, Camacho’s distributor. “To hit the mark, our master builders worked with the team at Flor de Caña in Nicaragua to hand select these barrels for optimal humidity, some of which had been filled with rum for 25 years. The result is a powerful new blend that invites aficionados around the globe to stare down the barrel of Nicaragua’s true spirit.” Camacho Nicaragua Barrel-Aged will retail in the $10 to $12 range. 2) Davidoff is releasing the new Master Selection Series, a collection of cigars from longtime master blender Eladio Diaz that were previously distributed non-commercially (and only in very small quantities) in celebration of Diaz’s birthdays. Six different cigars will be available—a toro from the years 2007, 2008, 2010, 2011, 2013, and 2016—each with a retail price of $35. Three will head to Davidoff merchants, and three will be relegated to Davidoff stores. 3) Inside the Industry: Cubariqueño Cigar Company announced the release of three Protocol-branded coffees—Protocol Azul, Protocol Rojo, and Protocol Oro—in partnership with Layne Coffee Company. Black Label Trading Company is once again releasing Morphine, a limited release sporting a Mexican San Andrés maduro wrapper and Nicaraguan binder and filler tobaccos, made at the Fabrica Oveja Negra factory in Estelí, Nicaragua. 4) From the Archives: Our Cigar University page is a collection of articles handpicked for cigar smokers who want to expand their cigar knowledge. The 100-level articles cover the basics, while the 200-, 300-, and 400-level articles provide more advanced suggestions for understanding, caring for, and appreciating cigars. 5) Deal of the Week: Monday’s review praised the Padrón Serie 1964 Prototype Natural as “a compact, concentrated iteration of a blend we all know and love that delivers exactly as expected.” The cigar is available only at Smoke Inn and is currently still available. Make a purchase today and use the code “StogieDeal” at checkout to land a free triple-flame tabletop lighter (a $50 value).